is a conversational AI designed to alleviate food insecurity among college students. 1/4 of students at UC Berkeley are food insecure. UC Berkeley is home to a little over 40,000 students, of which a fourth don’t know when or where their next meal will be. The high academic and social demands of a higher education inevitably cultivates a difficult environment for students to thrive in. However, many students with insufficient basic need resources, such as food, struggle to meet these demands due to the stresses of finding enough meals to eat. 40% of University of California (UC) students experience food insecurity daily. 28.2% of UC Berkeley students don’t have the money to buy enough food to sustain themselves. 23% of undergraduates skip meals regularly. With these alarmingly high statistics, it is imperative that students have resources and campus climates that help them become basic needs secure. The current basic needs ecosystem at UC Berkeley is expansive and difficult to navigate. Because advisors are few and far in between, students must navigate this ecosystem alone. Of the 10,000+ students who experience food insecurity on the UC Berkeley campus, less than 25% have utilized the most advertised and accessible resources for food insecurity. Every student has a unique set of circumstances that requires individual attention and need a way to understand the benefits of different resources as well as how to access them. Currently this is done through individual advisors; however, there are upwards of five advisors who know the ecosystem well enough to communicate this information, not enough to serve the 10,000+ food insecure students on campus. Our most important product to this platform is a chatbot, nicknamed Maria, that can simulate the exact conversation that Ruben Canedo from the UC Food Security Committee can provide these students. Simulate the process of having an advisor who can provide individualized advice, but scale at the same time. Ensure an anonymous process to maximize the number of students that would be willing to seek help and address their unique circumstances to combat stigmas and stresses around these sensitive topics. Representation matters. 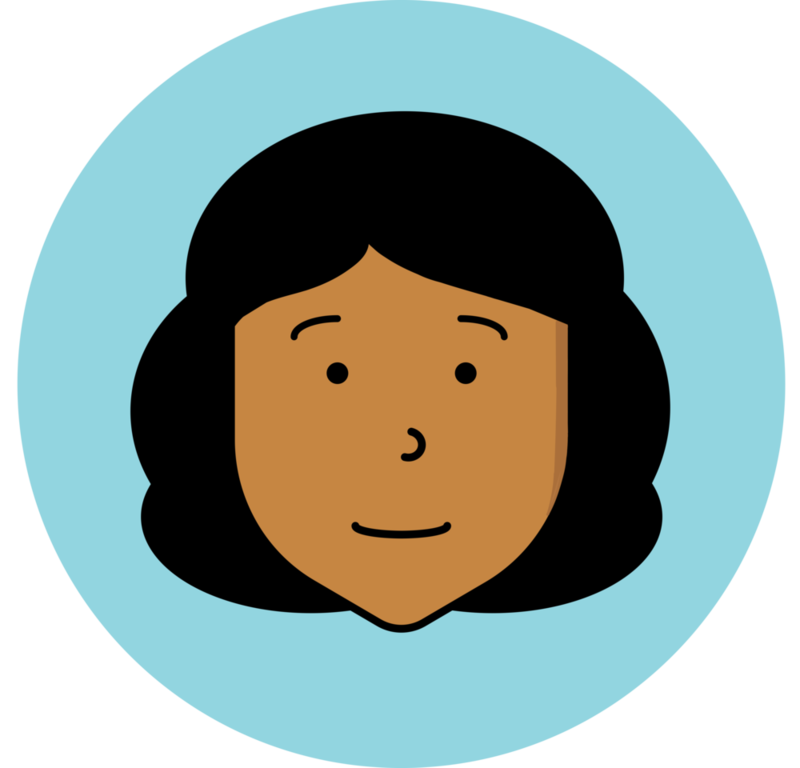 We designed Maria, the face of our chatbot, as a womxn of color because we believe womxn of color should become a familiar face when we think about who is at the forefront of solving complex issues like food insecurity. The most crucial component of our solution is to consolidate information and supplement all the efforts that have already been done to address food insecurity on campus. We understand how difficult reaching out for help can be, so our approach to the design process was to create an empathetic space. Not only do students have insufficient access to food, but they also may feel internalized shame from cultural stigmas surrounding food insecurity. Because of this, we were intentional with how we designed the dialogue behind Maria. Not only does she offer immediate solutions, but she is also encouraging and cares about the individual’s long-term well-being. We also recognize that experiencing food insecurity can cause feelings of anxiety and depression. We designed Maria to detect keywords, such as "sad," "anxious," and "depressed," so she can recommend mental health resources. Ultimately, food security is a right, not a privilege. And at UC Berkeley, this right is not realized for thousands of students every day. While resources necessary to support every student do exist, external factors such as a massive ecosystem and lack of advising coupled with internal factors such as cultural stigmas and internalized shame mean that only a fraction of students get the help they need. As we continue to modify these solutions to adapt with various challenges and new learnings we face, we hope that NourishAI will alleviate these issues, and help bring food security to all students on our campus and beyond. The team (nicknamed Beluga Whales) at Google Launchpad in San Francisco. Thank you to my incredible and thoughtful teammates for dedicating their talents and energy to advocate for spaces that are addressing food insecurity at UC Berkeley.